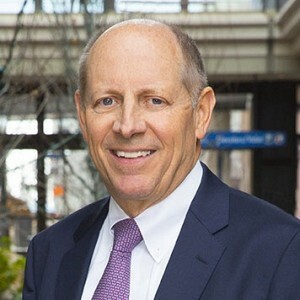 Harris H. Simmons is the chairman and chief executive officer of Zions Bancorporation, a $60 billion (assets) bank holding company that operates approximately 435 full-service banking offices throughout the western United States. A native of Salt Lake City, Simmons first worked for Zions in 1970 and has served in a variety of positions with Zions First National Bank and Zions Bancorporation in his more than 30 years with the organization. His positions have included serving as chief financial officer for Zions Bancorporation for five years and president from 1986 to 2014. Mr. Simmons became CEO of Zions Bancorporation in 1990. In April 2002, Simmons added the role of chairman to his duties. Simmons received a bachelor’s degree in economics from the University of Utah in 1977, and a Master’s in Business Administration (MBA) degree from Harvard Business School in 1980. Active in community and industry affairs, Simmons has served as chairman or president of Utah Symphony, Utah Foundation, and Economic Development Corporation of Utah. He is chairman of Pioneer Theatre Company, president of the Shelter the Homeless Committee, and serves on the boards of Utah Youth Village and Alliance for Unity. He is a member of the Board of Regents of the Utah System of Higher Education. He also serves on the board of directors for Dominion Midstream Partners, National Life Group (Vermont), and O.C. Tanner Company. He is past chairman of the American Bankers Association and is a member of the Financial Services Roundtable.